Only one track by Ray Sharpe featuring Hendrix on guitar seems to survive. Hendrix also played on a Sharpe session on the 28th of April 1966 in New York, but the results were never released and the master tapes were destroyed in a fire in 1978.The session included: King Curtis - Tenor sax, Jimi Hendrix - Guitar, Cornell Dupree - Guitar, Chuck Rainey - Bass, Ray Lucas - Drums and Bernard "Pretty" Purdie - Drums. They recorded a remake of Sharpe's "Linda Lu", "I can't take it" and "Baby how about you". Ray Sharpe did release "I can't take it" on the 45 "I can't take it / Mary Jane" (Atco 45-6437) in September 1966 1, but this was a different take recorded in Dallas on the 4th of August 1966 with no involvement by Hendrix. The only available Ray Sharpe release featuring Hendrix is the 45 "Help me (get the feeling) - part I / Help me (get the feeling) - part II" (Atco 45-6402) which doesn't seem have much of an impact. It's producer King Curtis didn't leave the master to gather dust. It first re-surfaced with the same backing track but with Sharpe's vocals replaced by Owen Grey as "Help Me" by Owen Grey. Then Jimi`s guitar part was wiped and new overdubs were made after which the track was released as "Save Me" with a new vocal by Aretha Franklin on the Lp "I Never Loved A Man The Way I Love You" in 1967. Finally the track was released as the (almost) instrumental "Instant Groove" on the King Curtis 45 "Instant Groove / Sweet Inspiration" (Atco 45-6680) in 1969, once again featuring new overdubs but retaining Jimi`s guitar part. 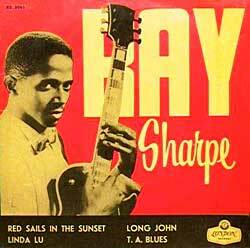 The Atlantic tape logs list a Ray Sharpe session for 29 November 1965, and one of the tracks recorded was "Gettin' the feeling (Help me)". No recording personnel is listed, and nothing from this session was ever released. One possibility is that the earlier take was scheduled for release, but then it was decided to do a re-recording, but the matrix number already assigned in 1965 was still used even if the year had changed. This seems unlikely though, as one assumes that the numbers were given when the mastering was done, and Atco probably wouldn't have wasted money on mastering a track and then scrapping it, especially with a small time artist like Sharpe. By an amazing co-incidence a tape has survived of Jimi acknowledging that he plays on the track. In the interview tape recorded in March 1967 in the Speakeasy in London which includes a journalist, Eric Clapton and Hendrix having a drink and a chat when the track is played in the club. Only one mix of the track exists, in mono. This was split in two and released as a 45. 1 The 45 was listed in Billboard issue 17 September 1966 in the "Spotlight Singles" -section under the subheader "Predicted to reach the HOT 100 Chart"